How does my form connect with my website? Do I put a link on my website to the form? Can I cut and paste my form directly to my website? Thanks! 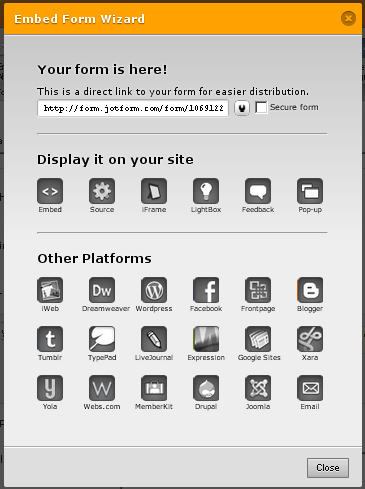 Welcome to JotForm - the fastest, easiest, and cleanest form builder! You can either put a link to your JotForm form from your website or cut and paste a snippet of code that you can obtain from the Embed Form Wizard (similar to the screenshot below) so that you can embed it into your website. That's how flexible JotForm can get to accommodate your requirements. Please do not hesitate to contact us again anytime you need assistance. Thank you and enjoy using JotForm!